Primer protects bare metal surfaces. Suitable for interior and limited exterior applications, Aquacron 833 can be field top coated with water reducible alkyd enamels or solvent-based enamels after thoroughly dried. Low-odor product contains no heavy metals, is VOC-compliant, and has less than 1 lb of organic HAPS/gal of solids. Applications include metal fabrication, structural steel, industrial machinery, cabinets, racking, and shelving. PPG TrueFinish announces Aquacron 833, a water reducible shop primer that is a fast drying interior/exterior primer intended for industrial use on bare metal surfaces. 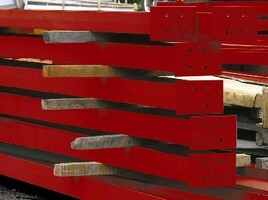 Suitable applications include metal fabrication, structural steel, industrial machinery, cabinets, racking and shelving. PPG is a world leader in coatings manufacturing and technology with facilities and equity affiliates in more than 60 countries. Now, thanks to PPG TrueFinish®, big shops aren't the only ones who can command top-notch industrial coatings. The TrueFinish team delivers PPG quality for any size job or business. For more information on this product or any of our others please email us at truefinishsupport@ppg.com or visit our website at www.ppgtruefinish.com.